Surprising as it may seem cockroaches can be a problem in the United Kingdom. There is no doubting these infamous insects prefer a more temperate climate but some hardy species of the cockroach family are happy to tough it out in the colder reaches of Europe. There are two main types of cockroach found in England – the German cockroach and the Oriental cockroach. While the sight and sound of an intrusion of cockroaches is certainly responsible for the general dislike and fear they are greeted with it is their capability to spread disease that people should be most concerned about. These insects feed on just about anything, shedding their skins and spreading droppings as they go. As such the risk of contamination is high – and their very presence can trigger allergies and asthma. The Oriental cockroach can withstand outside temperatures so there is a chance this could be found in refuse area, but otherwise cockroaches generally head for shelter. Areas with moisture are particularly popular such as kitchens, bathrooms and pipe work as well as basements. Once they have found a place to make their homes cockroaches can multiply quickly, laying eggs that can produce up to 50 cockroaches in a short time. This is why cockroaches are seen as such as serious pest. 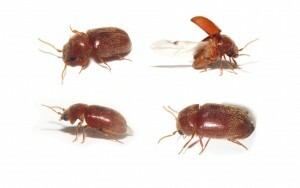 As cockroaches thrive in such large numbers of you spot one, it is likely there are more so the first step is to try to spot more. In the unfortunate event of discovering cockroaches in your property call in pest control experts immediately as the problem will only get worse. To keep cockroaches out of your property it is wise to keep your house clean and in good repair. As applies to all household pests, be vigilant when dealing with food scraps and make sure they are promptly cleared up and thrown away into a closed container. Make sure small entrance to the home such as broken brickwork, tiles or seals are repaired and keep kitchen areas clean – including floors. If you are concerned you might have a cockroach infestation at your property get in touch with Pest Busters today.